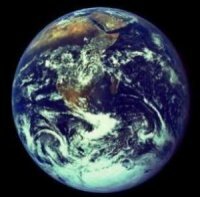 We succeeded in taking that picture [of Earth from deep space], and, if you look at it, you see a dot. That's here. That's home. That's us... on a mote of dust, suspended in a sunbeam.The earth is a very small stage in a vast cosmic arena. Think of the rivers of blood spilled by all those generals and emperors so that in glory and in triumph they could become the momentary masters of a fraction of a dot...Our posturings, our imagined self-importance, the delusion that we have some privileged position in the universe, are challenged by this point of pale light. Our planet is a lonely speck in the great enveloping cosmic dark. In our obscurity -- in all this vastness -- there is no hint that help will come from elsewhere to save us from ourselves. It is up to us. It's been said that astronomy is a humbling, and I might add, a character-building experience. To my mind, there is perhaps no better demonstration of the folly of human conceits than this distant image of our tiny world. To me, it underscores our responsibility to deal more kindly and compassionately with one another and to preserve and cherish that pale blue dot, the only home we've ever known. Think for yourselves and let others enjoy the privilege to do so, too. My strength lies mainly in my tenacity. Talent will not; nothing is more common than unsuccessful men with talent. "There was a star danced, and under that was I born." There bade me gaze, and there aspire." When I was a boy of fourteen my father was so ignorant I could hardly stand to have the old man around. But when I got to be twenty-one, I was astonished at how much he had learned in seven years. A large part of [the purpose] of education may well be what men have most feared and most desired - the achievement of moments of ecstasy. "I do not know what I may appear to the world, but to myself I seem to have been only a boy playing on the seashore, and diverting myself in now and then finding a smoother pebble or a prettier shell than ordinary. Whilst the great ocean of truth lay all undiscovered before me." To sit alone with my conscience will be judgement enough for me. I am not an Athenian or a Greek, I am a citizen of the world. It is well to remember that the entire universe, with one trifling exception, is composed of others. At the heart of science is an essential tension between two seemingly contradictory attitudes -- an openness to new ideas, no matter how bizarre or counterintuitive they may be, and the most ruthless skeptical scrutiny of all ideas, old and new. This is how deep truths arewinnowed from deep nonsense. Of course, scientists make mistakes in trying to understand the world, but there is a built-in error-correcting mechanism: The collective enterprise of creative thinking and skeptical thinking together keeps the field on track. Carl Sagan, "The Fine Art of Baloney Detection,"
I'm often asked the question, "Do you think there is extraterrestrial intelligence?" I give the standard arguments there are a lot of places out there, and use the word *billions*, and so on. And then I say it would be astonishing to me if there weren't extraterrestrial intelligence, but of course there is as yet no compelling evidence for it. And then I'm asked, "Yeah, but what's your gut feeling?" But I try not to think with my gut. Really, it's okay to reserve judgment until the evidence is in. With the selfsame winds that blow. Which tells us the way to go. You can paint with all the colors of the wind. Some say the world will end in fire, some say in ice. "There's no roof that has not a star above it." What is so good in a college as an observatory? as you ascend; - that this is the road to the stars. and we leave ... the Americas and history at the door when we come in. "Look at the stars! look, look up at the skies! O look at all the fire-folk sitting in the air!" "No one regards what is before his feet; we all gaze at the stars"
How I wonder what you are." And these the gems of heaven, her starry train." Stars gave the first delight. Those little drops of light." Look'd up in perfect silence at the stars. Jai Guru De Va Om. Nothing's gonna change my world." "Satellites gone up to the sky. Things like that drive me out of my mind. I watched it for a little while. I love to watch things on TV. Satellites gone, way up to Mars. Soon it will be filled with parking cars. I like to watch things on TV. a common occurence around the bed each night. you must be prepared also to lose every day. the one who defines her life? "Do you remember my name? or were her eyes so beautiful because she was loved? And the stars are shining bright." And think to wed it, he is so above me." Huge cloudy symbols of a high romance." "What is love?...It is the morning and the evening star." Of each other all we are. Lonely for the other's sake. I have loved the stars too fondly to be fearful of the night." A star that burns forever in that sky." And pay no worship to the garish sun." The heavens themselves blaze forth the death of princes. Beckon the wanderer to his vaster home." To dream of untriangulated stars." they are allowed to operate. proposal for finding a new trade route to the Indies. Queen Isabella of Spain later funded the project. vision of the world, and all the wonder that would be. Give me a lever long enough, and a prop strong enough. I can single-handed move the world. Give me a place to stand, and I will move the earth. If the accomplishment be not for me, 'tis for some other. But why, some say, the moon? Why choose this as our goal? And they may well ask, why climb the highest mountain? Why, 35 years ago, fly the Atlantic? Why does Rice play Texas? We choose to go to the moon. but because they are hard. Okay, engine stop, ACA out of detent." descent engine command override, off. Engine arm off. 413 is in." CAPCOM(DUKE): "We copy you down, Eagle." ARMSTRONG: "Houston, Tranquility Base here. We copy you on the ground. You've got a bunch of guys about to turn blue. We're breathing again. Thanks a lot." first set foot upon the Moon July 1969, A.D.
-- Apollo 11 plaque left on Moon. all of the people on this Earth are truly one. I found myself standing on the surface of the moon. what can be more fantastic? the epoch of the more intensive study of the firmament. the vaster and more marvelous it becomes. -- Charles A. Lindbergh's "Autobiography of Values." should be devoted to peaceful purposes for the benefit of all mankind. or in fact of a social life which is not appalling to imagine. "We cannot simultaneously prepare for and prevent war." thoughtful committed citizens can change the world. Indeed, that's the only thing that ever has. keeps its place and all the stars turn toward it." and bamboozle requires intelligence, vigilance, dedication and courage. nation of suckers, up for grabs by the next charlatan who comes along. -- Carl Sagan, "The Fine Art of Baloney Detection,"
There is no fellow in the firmament." and I did not stand up, because I was not a Communist. and I did not stand up, because I was neither. and I did not stand up, because I was not a Jew. and I did not stand up, because I was Protestant. and there was no one left to stand up for me.